This article is about the federal political party in Canada. For other political parties with the same name, see New Democratic Party (disambiguation). The New Democratic Party (NDP; French: Nouveau Parti démocratique, NPD) is a social-democratic political party in Canada. The interim leader of the federal wing of the NDP is Thomas Mulcair, who was elected in the 2012 leadership election, led the party through the 2015 federal election and then lost a party leadership review on April 10, 2016. Mulcair will remain as leader, until his replacement is chosen at a leadership election to be held within two years. The NDP was founded in 1961 out of the merger of the Co-operative Commonwealth Federation (CCF) with the Canadian Labour Congress (CLC). One provincial wing of the NDP forms government in Alberta. Previously, provincial wings of the party have formed governments in British Columbia (1972–1975, 1991–2001), Nova Scotia (2009–2013), Ontario (1990–1995), Saskatchewan (1971–1982, 1991–2007), and Manitoba (1969–1977,1981–1988, 1999–2016), and the territorial party formed the government in Yukon (the only territory with a partisan legislature) from 1985–1992 and 1996–2000. Unlike other political parties in Canada, the federal and provincial (or territorial) level NDPs are fully integrated, and have shared membership. The NDP has often been Canada's third largest party in Parliament, at times aligning itself with the Liberal Party of Canada, as it did during the minority government of Pierre Trudeau from 1972-1974. Following the 1993 federal election the NDP was reduced to fourth place behind the Bloc Québécois, a position it would maintain for most of the next two decades. 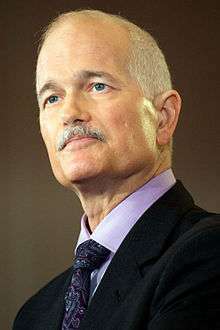 In the 2011 federal election under the leadership of Jack Layton, the NDP won the second-most seats in the House of Commons, gaining the title of Her Majesty's Loyal Opposition for the first time in the party's history. The NDP then lost 59 seats during the 2015 federal election and fell back to third place in Parliament. The NDP evolved in 1961 from a merger of the Canadian Labour Congress (CLC) and the Co-operative Commonwealth Federation (CCF). The CCF grew from populist, agrarian and socialist roots into a modern socialist party. Although the CCF was part of the Christian left and the Social Gospel movement, the NDP is secular and pluralistic. It has broadened to include concerns of the New Left, and advocates issues such as LGBT rights, international peace, and environmental stewardship. The NDP has never formed the federal government. It formed the Official Opposition for the first time in the 41st Canadian Parliament. Before 2011, the party had been a stable presence in the Canadian parliament, and was the third largest political party from 1961 to 1993, when the party lost official status. The NDP's peak period of policy influence in those periods was during the minority Liberal governments of Lester B. Pearson (1963–68) and Pierre Trudeau (1972–74). After reattaining official party status in 1997, the NDP played a similar role in the Liberal and Conservative minority governments of 2004–2011. Provincial New Democratic parties, which are organizationally sections of the federal party, have governed in half the provinces and a territory. The NDP governs the province of Alberta, forms the Official Opposition in British Columbia, Manitoba, and Saskatchewan, and have sitting members in every provincial legislature except those of Quebec, New Brunswick, and Prince Edward Island. The NDP has formed the government in the provinces of Ontario, Saskatchewan, British Columbia, Nova Scotia and the Yukon Territory. While members of the party are active municipally, the party does not organize at that level. For example, though former Toronto mayor David Miller was an NDP member during his successful 2003 and 2006 mayoral campaigns, his campaigns were not affiliated with the NDP. In 1956, after the birth of the Canadian Labour Congress (CLC) by a merger of two previous labour congresses, negotiations began between the CLC and the Co-operative Commonwealth Federation (CCF) to bring about an alliance between organized labour and the political left in Canada. In 1958 a joint CCF-CLC committee, the National Committee for the New Party (NCNP), was formed to create a "new" social-democratic political party, with ten members from each group. The NCNP spent the next three years laying down the foundations of the New Party. During this process, a large number of New Party Clubs were established to allow like-minded Canadians to join in its founding, and six representatives from New Party Clubs were added to the National Committee. In 1961, at the end of a five-day long Founding Convention which established its principles, policies and structures, the New Democratic Party was born and Tommy Douglas, the long-time CCF Premier of Saskatchewan, was elected its first leader. In 1960, before the NDP was founded, one candidate, Walter Pitman, won a by-election under the New Party banner. The influence of organized labour on the party is still reflected in the party's conventions as affiliated trade unions send delegates on a formula based on their number of members. Since approximately one-quarter of the convention delegates have recently been from affiliated labour groups, after the party changed to an one member, one vote method of electing leaders in leadership races, labour delegate votes are scaled to 25% of the total number of ballots cast for leader. At the 1971 leadership convention, an activist group called The Waffle tried to take control of the party, but were defeated by David Lewis with the help of trade union members. The following year, most of The Waffle split from the NDP and formed their own party. The NDP itself supported the minority government formed by the Pierre Trudeau-led Liberals from 1972 to 1974, although the two parties never entered into a coalition. Together they succeeded in passing several socially progressive initiatives into law such as pension indexing and the creation of the crown corporation Petro-Canada. In 1974, the NDP worked with the Progressive Conservatives to pass a motion of non-confidence, forcing an election. However, it backfired as Trudeau's Liberals regained a majority government, mostly at the expense of the NDP, which lost half its seats. Lewis lost his own riding and resigned as leader the following year. 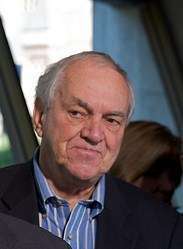 Under the leadership of Ed Broadbent (1975–1989), the NDP attempted to find a more populist image to contrast with the governing parties, focusing on more pocketbook issues than on ideological fervor. The party played a critical role during Joe Clark's minority government of 1979–1980, moving the non-confidence motion on John Crosbie's budget that brought down the Progressive Conservative government, and forced the election that brought Trudeau's Liberal Party back to power. The result in 1980 created two unexpected results for the party: The first was an offer by Trudeau to form a coalition government to allow for greater Western representation in Cabinet and a "united front" regarding the upcoming Quebec referendum. Broadbent, aware that the NDP would have no ability to hold the balance of power and thus no leverage in the government, declined out of fear the party would be subsumed. The second was Trudeau's Canada Bill to patriate the Constitution of Canada unilaterally and to bring about what would become the Canadian Charter of Rights and Freedoms. Broadbent endorsed the initiative, which was directly opposed by the NDP government of Saskatchewan and many of the party's Western parties and members, creating severe internal tension. Broadbent would act as a moderating influence on Trudeau during the debates, and the eventual compromise that brought about the Constitution Act, 1982 was partially authored by Saskatchewan NDP Attorney General Roy Romanow. In the 1984 election, which saw the Progressive Conservatives win the most seats in Canadian history, the NDP won 30 seats, while the governing Liberals fell to 40 seats. Struggles within the governing Conservatives and opposition Liberals would see dramatic rise in the NDP's polling fortunes. The NDP set a new record of 43 Members of Parliament (MPs) elected to the house in the election of 1988. The Liberals, however, had reaped most of the benefits of opposing free trade to emerge as the dominant alternative to the ruling government. In 1989, Broadbent stepped down after 14 years as federal leader of the NDP. At the party's leadership convention, former B.C. Premier Dave Barrett and Audrey McLaughlin were the main contenders for the leadership. During the campaign, Barrett argued that the party should be concerned with western alienation, rather than focusing its attention on Quebec. The Quebec wing of the NDP strongly opposed Barrett's candidacy, with Phil Edmonston, the party's main spokesman in Quebec, threatening to resign from the party if Barrett won. McLaughlin ran on a more traditional approach, and became the first woman to lead a major Federal political party in Canada. Although enjoying strong support among organized labour and rural voters in the Prairies, McLaughlin tried to expand their support into Quebec without much success. In 1989, the New Democratic Party of Quebec adopted a sovereigntist platform and severed its ties with the federal NDP. Under McLaughlin, the party did manage to win an election in Quebec for the first time when Edmonston won a 1990 by-election. The NDP chose to align itself with the Progressive Conservatives and Liberals on the "yes" side of the Charlottetown Accord referendum in 1992. 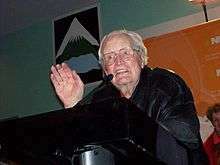 Barrett reluctantly endorsed it to comply with party policy (he opposed the Meech Lake Accord in 1987), but later referred to the NDP's support for the Accord as a mistake. Edmonston, a Quebec nationalist, frequently clashed with his own party over this position on Canadian federalism, and did not run for re-election. McLaughlin and the NDP were routed in the 1993 election, where the party won only nine seats, three seats short of official party status in the House of Commons. The loss was blamed on the unpopularity of NDP provincial governments under Bob Rae in Ontario and Mike Harcourt in British Columbia and the loss of a significant portion of Western vote to the Reform Party, which promised a more decentralized and democratic federation along with right-wing economic reforms. McLaughlin resigned in 1995 and was succeeded by Alexa McDonough, the former leader of the Nova Scotia NDP. In contrast to traditional but diminishing Canadian practice, where an MP for a safe seat stands down to allow a newly elected leader a chance to enter Parliament via a by-election, McDonough opted to wait until the next election to enter Parliament. The party recovered somewhat in the 1997 election, electing 21 members. The NDP made a breakthrough in Atlantic Canada, a region where they had been practically nonexistent at the federal level. Before 1997, they had won only three seats in the Atlantic in their entire history. However, in 1997 they won eight seats in that region, in the process unseating Liberal ministers David Dingwall and Doug Young. The party was able to harness the discontent of voters in the Atlantic, who were upset over cuts to employment insurance and other social programs. Afterwards, McDonough was widely perceived as trying to move the party toward the centre of the political spectrum, in the Third Way mould of British Prime Minister Tony Blair. Union leaders were lukewarm in their support, often threatening to break away from the NDP, while Canadian Auto Workers head Buzz Hargrove called for her resignation. MPs Rick Laliberté and Angela Vautour crossed the floor to other parties during this term, to the Liberals and Progressive Conservatives respectively, reducing the NDP caucus to 19 seats. In the November 2000 election, the NDP campaigned primarily on the issue of Medicare but lost significant support. The governing Liberals ran an effective campaign on their economic record and managed to recapture some of the Atlantic ridings lost to the NDP in the 1997 election. The initial high electoral prospects of the Canadian Alliance under new leader Stockwell Day also hurt the NDP as many supporters strategically voted Liberal to keep the Alliance from winning. The NDP finished with 13 MPs—just barely over the threshold for official party status. The party embarked on a renewal process starting in 2000. 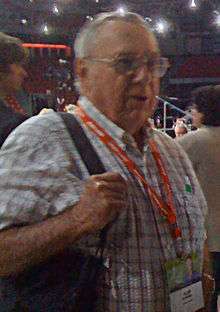 A general convention in Winnipeg in November 2001 made significant alterations to party structures, and reaffirmed its commitment to the left. In the May 2002 by-elections, Brian Masse won the riding of Windsor West, Ontario, previously held for decades by a Liberal, former Deputy Prime Minister Herb Gray. McDonough announced her resignation as party leader for family reasons in June 2002, and was succeeded by Jack Layton in January 2003. A Toronto city councillor and recent President of the Federation of Canadian Municipalities, Layton was elected at the party's leadership election in Toronto on January 5, 2003, defeating his nearest rival, longtime Winnipeg-area MP Bill Blaikie, on the first ballot with 53.5% of the vote. Layton had run unsuccessfully for the Commons three times in Toronto-area ridings. Like McDonough before him, Layton did not contest a seat in Parliament until the 2004 election. In the interim, he appointed Blaikie as deputy leader and made him parliamentary leader of the NDP. The 2004 election produced mixed results for the NDP. It increased its total vote by more than a million votes; however, despite Layton's optimistic predictions of reaching 40 seats, the NDP only gained five seats in the election, for a total of 19. The party was disappointed to see its two Saskatchewan incumbents defeated in close races by the new Conservative Party (created by merger of the Alliance and PC parties), perhaps because of the unpopularity of the NDP provincial government. Those losses caused the federal NDP to be shut out in Saskatchewan for the first time since the 1965 election, despite obtaining 23% of the vote in the province. Exit polls indicated that many NDP supporters voted Liberal to keep the new Conservative Party of Canada from winning. The Liberals had recruited several prominent NDP members, most notably former British Columbia Premier Ujjal Dosanjh, to run as Liberals as part of a drive to convince NDP voters that a reunited Conservative Party could sneak up the middle in the event of a split in the centre-left vote. The Liberals were re-elected, though this time as a minority government. Combined, the Liberals and NDP had 154 seats – one short of the total needed for the balance of power. As has been the case with Liberal minorities in the past, the NDP were in a position to make gains on the party's priorities, such as fighting health care privatization, fulfilling Canada's obligation to the Kyoto Protocol, and electoral reform. The party used Liberal Prime Minister Paul Martin's politically precarious position caused by the sponsorship scandal to force investment in several federal programs, agreeing not to help topple the government provided that some major concessions in the federal budget were made. The governing Liberals agreed to support the changes in exchange for NDP support on confidence votes. On May 19, 2005, by Speaker Peter Milliken's tie-breaking vote, the House of Commons voted for second reading on major NDP amendments to the federal budget, preempting about $4.5 billion in corporate tax cuts and funding social, educational and environmental programs instead. NDP supporters and Conservative opponents of the measures branded it Canada's first "NDP budget". In late June, the amendments passed final reading and many political pundits concluded that the NDP had gained credibility and clout on the national scene. On November 9, 2005, after the findings of the Gomery Inquiry were released, Layton notified the Liberal government that continued NDP support would require a ban on private healthcare. When the Liberals refused, Layton announced that he would introduce a motion on November 24 that would ask Martin to call a federal election in February to allow for several pieces of legislation to be passed. The Liberals turned down this offer. On November 28, 2005, Conservative leader Stephen Harper's motion of no confidence was seconded by Layton and it was passed by all three opposition parties, forcing an election. Columnist Andrew Coyne has suggested that the NDP was unlikely to receive much credit for continuing to further prop up the Liberals, so they ended their support for the Martin government. During the election, the NDP focused their attacks on the Liberal party, in order to counter Liberal appeals for strategic voting. A key point in the campaign was when Judy Wasylycia-Leis had asked the Royal Canadian Mounted Police (RCMP) to launch a criminal investigation into the leaking of the income trust announcement. The criminal probe seriously damaged the Liberal campaign and prevented them from making their key policy announcements, as well as bringing Liberal corruption back into the spotlight. After the election, the RCMP announced the conclusion of the income trust investigation and laid a charge of 'Breach of Trust' against Serge Nadeau, an official in the Department of Finance, while Liberal Finance Minister Ralph Goodale was cleared of wrongdoing. The NDP campaign strategy put them at odds with Canadian Auto Workers (CAW), which had supported an NDP-backed Liberal minority government and which was only backing NDP candidates that had a chance of winning. After the campaign, the Ontario NDP expelled CAW leader Buzz Hargrove from the party (which has a common membership both federally and provincially, see below) for his support of the Liberals. On January 23, the NDP won 29 seats, a significant increase of 10 seats from the 19 won in 2004. It was the fourth-best performance in party history, approaching the level of popular support enjoyed in the 1980s. The NDP kept all of the 18 seats it held at the dissolution of Parliament (Paul Dewar retained the riding of Ottawa Centre vacated by Broadbent). Bev Desjarlais, an NDP MP since 1997, unsuccessfully ran as an independent in her Churchill riding after losing the NDP nomination. While the party gained no seats in Atlantic Canada, Quebec, or the Prairie Provinces, it gained five seats in British Columbia, five more in Ontario and the Western Arctic riding of the Northwest Territories. The Conservatives won a minority government in the 2006 election, and initially the NDP was the only party that would not be able to pass legislation with the Conservatives. However, following a series of floor crossings, the NDP also came to hold the balance of power. The NDP voted against the government in all four confidence votes in the 39th parliament, the only party to do so. These were votes on the United States-Canada softwood lumber dispute, extending the mission to Afghanistan, the 2006 Canadian federal budget and 2007 federal budget. However, it worked with the Conservatives on other issues. After forcing the Conservatives to agree to certain revisions, the NDP helped pass the Accountability Act. After the NDP fiercely criticized the initial Conservative attempt at a Clean Air Act, the Conservatives agreed to work with the NDP and other parties to revise the legislation. The NDP also supported the government in introducing regulations on income trusts, fearing that trends toward mass trust conversions by large corporations to avoid Canadian income taxes would cause the loss of billions of dollars in budget revenue to support health care, pensions and other federal programs. At the same time, the NDP was also wary of the threat of investor losses from income trusts' exaggerated performance expectations. Since that election, the NDP caucus rose to 30 members following the victory of NDP candidate Thomas Mulcair in a by-election in Outremont. This marked the second time ever (and first time in seventeen years) that the NDP won a riding in Quebec. The party won 37 seats in the 2008 federal election, the best performance since the 1988 federal election total of 43. In the 2011 federal election the NDP won a record 103 seats, becoming the Official Opposition for the first time in the party's history. The party had a historic breakthrough in Quebec, where they won 59 out of 75 seats. This meant that a majority of the party's MPs now came from a province where they had only ever had two candidates elected in the party's history (Thomas Mulcair and Phil Edmonston, and not concurrently) and had not been fully organized since 1990 (see below). The NDP's success in Quebec was mirrored by the collapse of the Bloc Québécois, which lost all but four of its 47 seats, and the collapse of the Liberal Party nationally, which was cut down to just 34 seats, its worst-ever result. This also marked the first time in history where the Liberal Party was neither the government nor the Official Opposition, as the NDP had taken over the latter's role. Jack Layton's performance on the French-language talk show Tout le monde en parle on April 3 was credited for improving his party's standing among francophone voters; it is the most widely watched TV show in Quebec. He was also perceived to have performed well in the televised French-language party leaders' debate on April 13. The NDP held or won seats in every province but Saskatchewan and Prince Edward Island, and also held the Western Arctic riding coextensive with the Northwest Territories. It got more than the 10% threshold required for reimbursement of campaign expenses in all but two ridings in the country, an unprecedented result for it. 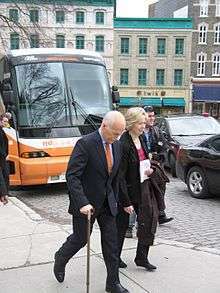 In July 2011, Layton announced that he was suffering from a new cancer and would take a leave of absence, projected to last until the resumption of Parliament in September. He would retain his position of NDP Leader and Leader of the Opposition. The party confirmed his suggestion of Hull—Aylmer MP Nycole Turmel to carry out the functions of party leader in his absence. Layton died from his cancer on August 22, 2011. In his final letter, Layton called for a leadership election to be held in early 2012 to choose his successor, which was held on March 24, 2012, and elected new leader Thomas Mulcair. Despite early campaign polls which showed an NDP lead, the party lost 59 seats on election night and fell back to third place in Parliament. By winning 44 seats Mulcair was able to secure the second best showing in the party's history, winning one more seat than Ed Broadbent managed in the 1988 election, but with a smaller share of the popular vote. NDP seat gains in Saskatchewan and British Columbia were offset by numerical losses in almost every other region with the exception of Alberta and Manitoba. The party was locked out of the Atlantic Region and the Territories, and lost over half of its seats in Ontario including all of its seats in Toronto. In Quebec the NDP lost seats to all three of the other major parties, namely the Liberals, Conservatives, and Bloc Québécois, though it managed to place second in both vote share (25.4%) and seats (16) behind the Liberals, who formed a majority government. Mulcair's leadership faced criticism following the election, particularly due to a moderate platform that the party was running on and Mulcair's promise to balance the federal budget while Liberal leader Justin Trudeau was promising to run a budget deficit in order to fund stimulus programs and higher social spending, a position which was perceived as allowing the Liberals to outflank the NDP on the left. Mulcair lost a leadership review vote held at the NDP's policy convention in Edmonton, Alberta on April 10, 2016. Consequently, his successor will be chosen at a leadership election to be held no later than October 2017. 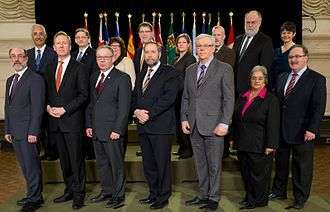 NDP leaders at the federal and provincial levels during a federal leaders summit on January 15, 2013. There are three exceptions: Nunavut, the Northwest Territories, and Quebec. In Nunavut and in the Northwest Territories, whose territorial legislatures have non-partisan consensus governments, the federal NDP is promoted by its riding associations, since each territory is composed of only one federal riding. In Quebec, the New Democratic Party of Quebec and the federal NDP agreed in 1989 to sever their structural ties after the Quebec party adopted the sovereigntist platform. Since then, the federal NDP is not integrated with a provincial party in that province; instead, it has a section, the Nouveau Parti démocratique-Section Québec/New Democratic Party Quebec Section, whose activities in the province are limited to the federal level, whereas on the provincial level its members are individually free to support or adhere to any party. However, following the 2011 election, it was announced the NDP planned on recreating a provincial party in Quebec in time for the next Quebec general election. From 1963 to 1994 there was a New Democratic Party of Quebec, which split from the party over issues of Quebec sovereignty and after several mergers with other left-wing parties formed Québec solidaire in 2006. The most successful provincial section of the party has been the Saskatchewan New Democratic Party, which first came to power in 1944 as the Co-operative Commonwealth Federation under Tommy Douglas and has won most of the province's elections since then. 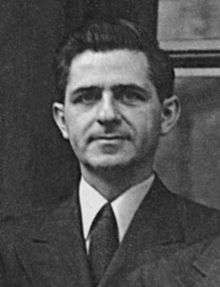 In Canada, Douglas is often cited as the Father of Medicare since, as Saskatchewan Premier, he introduced Canada's first publicly funded, universal healthcare system to the province. Despite the historic success of the Saskatchewan branch of the party, the NDP was shut out of Saskatchewan for the 2004, 2006, 2008, and 2011 federal elections, before winning three seats there in the 2015 federal election. The New Democratic Party has also formed government in Alberta, British Columbia, Manitoba, Nova Scotia, Ontario, and in Yukon. The federal NDP is widely portrayed as having voted to distance itself from a description of its politics as "socialist". Its most recent statement on this matter, however, as contained in the preamble to the party's constitution as amended on 14 April 2013, gives the most prominent place to the "social democratic" tradition as a basis for the party's orientation. This version of the preamble does not exclude the importance of other ideological influences upon the party over the course of its history. New Democrats are proud of our political and activist heritage, and our long record of visionary, practical, and successful governments. That heritage and that record have distinguished and inspired our party since the creation of the Co-operative Commonwealth Federation in 1933 and the founding of the New Democratic Party in 1961. New Democrats seek a future that brings together the best of the insights and objectives of Canadians who, within the social democratic and democratic socialist traditions, have worked through farmer, labour, co-operative, feminist, human rights and environmental movements, and with First Nations, Métis and Inuit peoples, to build a more just, equal, and sustainable Canada within a global community dedicated to the same goals. The 2011 federal election gave the NDP 103 seats. Following the death of Jack Layton and the defection of Saint-Maurice—Champlain MP Lise St-Denis to the Liberal Party, they were reduced to 101; Craig Scott's victory in the by-election to succeed Layton brought the party caucus back to 102 members, but they returned to 101 with the decision of Thunder Bay—Superior North MP Bruce Hyer to sit as an independent. On February 28, 2013, Claude Patry of Jonquière—Alma defected to the Bloc Québécois bringing seats held to 100 members. Olivia Chow, MP for Trinity—Spadina, resigned her seat on March 12, 2014 to run for mayor of Toronto. Manon Perreault became an independent. Sana Hassainia left the party to sit as an independent on August 20, 2014, citing a policy dispute over the Israeli–Palestinian conflict. Jean-François Larose left the party to form the political party, Strength in Democracy, with former Bloc Quebecois MP Jean-Francois Fortin. Only two NDP incumbents who ran for re-election were defeated: Jim Maloway in Elmwood—Transcona (MB), and Tony Martin in Sault Ste. Marie (ON). Bill Siksay in Burnaby—Douglas (BC) chose not to run again, but Kennedy Stewart retained the seat for the NDP. For a list of NDP MPs and their critic portfolios, see New Democratic Party Shadow Cabinet. The party president is the administrative chairperson of the party, chairing party conventions, councils and executive meetings. 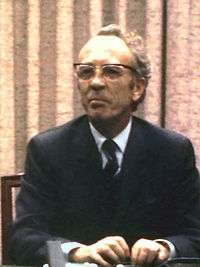 6 Donald C. MacDonald 1971–1975 Former leader of the Ontario NDP. 7 Joyce Nash 1975–1977 British Columbia party activist and feminist, first woman to become NDP president. 8 Alvin Hewitt 1977–1981 Previously president of the Saskatchewan NDP for 6 years. Adam Giambrone 2001–2006 At age 24, he was the youngest person to ever become president of a political party. 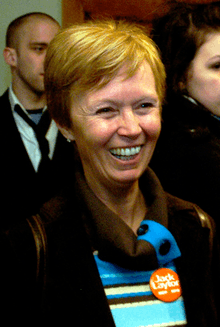 Anne McGrath 2006 – 2009 McGrath was elected at the 2006 party convention in Quebec City. Peggy Nash 2009 – 2011 Elected at the 2009 party convention in Halifax, Nova Scotia. 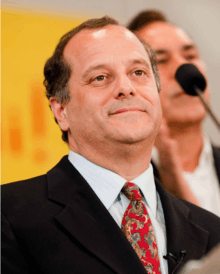 Brian Topp 2011 Resigned after three months to run for leader of the NDP following the death of Jack Layton. ↑ Neville, William (August 3, 1961). "Douglas Leads New Party, 'Democratic' Tag in Name". The Vancouver Sun. Vancouver. UPI. p. 1. Retrieved August 22, 2011. ↑ "NDP membership increase not as great as you might think". Yahoo! News. 2012-02-22. Retrieved 2013-09-06. ↑ Andrew Stevens (2013). "Power, Production, and Solidarity: trends in contemporary international labour studies". In Marcus Taylor. Renewing International Labour Studies. Routledge. p. 196. ISBN 978-1-317-98613-3. ↑ "Participants - Progressive Alliance". progressive-alliance.info. Retrieved October 12, 2016. ↑ "Member Parties of the Socialist International". Socialist International. Retrieved 7 May 2015. Bryan Evans; Ingo Schmidt (2012). Social Democracy After the Cold War. Athabasca University Press. ISBN 978-1-926836-87-4. Melody Hessing; Michael Howlett; Tracy Summerville (2005). Canadian Natural Resource And Environmental Policy: Political Economy And Public Policy. UBC Press. p. 176. ISBN 978-0-7748-1181-1. Rand Dyck (2011). Canadian Politics. Cengage Learning. p. 219. ISBN 978-0-17-650343-7. Norman Penner (1992). From Protest to Power: Social Democracy in Canada 1900-Present. James Lorimer & Company. ISBN 978-1-55028-384-6. John M. Herrick; Paul H. Stuart (2004). Encyclopedia of Social Welfare History in North America. SAGE. p. 337. ISBN 978-0-7619-2584-2. John Herd Thompson; Stephen J. Randall (2002). Canada and the United States: Ambivalent Allies. University of Georgia Press. p. 309. ISBN 978-0-8203-2403-6. Ian McLeod (1994). Under Siege: The Federal Ndp in the Nineties. James Lorimer & Company. ISBN 978-1-55028-454-6. Keith Archer (1990). Political Choices and Electoral Consequences: A Study of Organized Labour and the New Democratic Party. McGill-Queens. p. 15. ISBN 978-0-7735-0744-9. Richard Collin; Pamela L. Martin (2012). An Introduction to World Politics: Conflict and Consensus on a Small Planet. Rowman & Littlefield. p. 209. ISBN 978-1-4422-1803-1. Retrieved 18 July 2013. ↑ Reserved., . All Rights (April 13, 2013). "Mulcair calls on 'progressives' to unite under orange banner". canada.com. Retrieved October 12, 2016. ↑ Marc Guinjoan (2014). Parties, Elections and Electoral Contests: Competition and Contamination Effects. Ashgate. p. 62. ISBN 978-1-4724-3910-9. ↑ Bob Stewart (1983). "The United Church of Canada in British Columbia" (PDF). Retrieved April 15, 2011. 1 2 3 4 5 6 Quadri, Omair (13 October 2015). "Platform comparison: Where the parties stand on the top campaign issues". Globe and Mail. Retrieved 17 October 2015. ↑ Fedio, Chloe (11 June 2015). "NDP Leader Tom Mulcair says he'll seek mandate for Senate abolition". CBC News. Retrieved 17 October 2015. 1 2 NDP convention: A new preamble is approved. Macleans.ca (2013-04-14). Retrieved on 2014-04-12. ↑ Dehaas, Jeff (14 August 2015). "Fact Check: NDP and Liberals on the $15 minimum wage". CTV News. Retrieved 17 October 2015. ↑ NDP | Jack Layton's speech on Canada's role in the world Archived October 22, 2015, at the Wayback Machine. ↑ O'Malley, Kady (3 December 2014). "NDP bid to endorse proportional representation to be free vote for Liberals". CBC News. Retrieved 17 October 2015. ↑ Bolen, Michael (21 August 2015). "Mulcair pledges NDP will decriminalize pot 'the minute we form government'". CBC News. Retrieved 17 October 2015. ↑ The evolution of CCF into NDP: 1961 and after Archived February 5, 2009, at the Wayback Machine. ↑ "David Lewis - Federal NDP Leader 1971-75 - Biography of David Lewis". Canadaonline.about.com. Retrieved March 28, 2011. ↑ "CBC News Indepth: Ed Broadbent". Cbc.ca. Retrieved September 17, 2015. ↑ J. T. Morley. "Barrett, David". Thecanadianencyclopedia.com. Retrieved March 28, 2011. ↑ CBC News - Indepth Backgrounder: NDP Leadership Race Archived December 31, 2008, at the Wayback Machine. ↑ "CBC News Indepth: Budget 2005". Cbc.ca. June 24, 2005. Retrieved June 4, 2014. ↑ "Income trust a major campaign turning point". CTV.ca. January 22, 2006. Retrieved March 28, 2011. ↑ "Canada News Centre - Centre des nouvelles du Canada". News.gc.ca. September 29, 2008. Retrieved March 28, 2011. ↑ "Goodale cleared in trust case". Canada.com. February 16, 2007. Retrieved March 28, 2011. ↑ "Harper agrees to send Clean Air Act to committee". Cbc.ca. November 1, 2006. Retrieved June 4, 2014. ↑ François Lauzon (Aug 25, 2011). "Did sovereignist Lepage opened doors for Jack Layton?". Montreal Gazette. Retrieved October 15, 2011. ↑ Layton, Jack. "A letter to Canadians from the Honourable Jack Layton". New Democratic Party of Canada. Retrieved August 22, 2011. 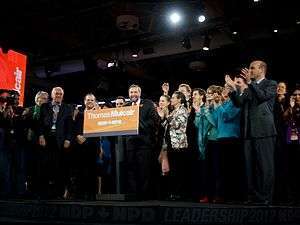 ↑ "NDP leadership convention: Thomas Mulcair holds on for victory". Vancouver Sun. 24 March 2012. Retrieved 24 March 2012. ↑ Elizabeth McSheffrey (2015-10-21). "Better luck next time, Mr. Mulcair". National Observer. Retrieved 2015-10-23. ↑ "Nouveau Parti Démocratique | Nouveau Parti Démocratique Section Québec". Npd.qc.ca. March 31, 2010. Retrieved April 28, 2010. ↑ "NDP coming to Quebec for next election". CBC News. August 17, 2012. Retrieved August 17, 2012. ↑ "New Democratic Party of Prince Edward Island". Ndppei.ca. Archived from the original on May 5, 2009. Retrieved April 28, 2010. ↑ Graham, Jennifer (October 20, 2015). "NDP hopes for major gains in Saskatchewan dashed by Conservatives". CityNews. The Canadian Press. Retrieved July 28, 2016. ↑ "Good news story, bad news story: the NDP in Saskatchewan". CBC News. October 20, 2015. Retrieved July 28, 2016. ↑ "NDP votes to take socialism out of party constitution". CBC. 1 2 "Constitution of the New Democratic Party of Canada, Effective April 2013" (PDF). New Democratic Party of Canada. ↑ "NDP MP Lise St-Denis jumping to Liberals". CBC News. January 10, 2012. Retrieved January 10, 2012. ↑ "Ex-BQ, NDP MPs form new federal party". cbc.ca. Retrieved October 12, 2016. ↑ Connor, Kevin (April 15, 2011). "Sun News talking the talk". Toronto Sun. Retrieved December 23, 2012. 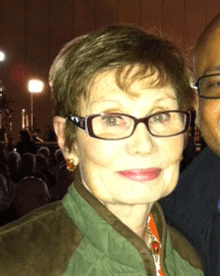 ↑ "Anne McGrath elected NDP President" (Press release). New Democratic Party. September 10, 2006. Archived from the original on September 30, 2008. Retrieved August 26, 2011. ↑ Galloway, Gloria (2009-08-15). "Folksy Dexter plays the hero". The Globe and Mail. Toronto. Retrieved 2009-09-22. ↑ Smith, Joanna (2011-06-19). "Heated debate as New Democrats defer motion to drop socialist from constitution". The Toronto Star. Toronto. Archived from the original on 2011-06-25. Retrieved 2011-06-25. ↑ Bryden, Joan (March 26, 2012). "NDP hunts for source of cyber-attack on electronic voting system". The Globe and Mail. The Canadian Press. Retrieved March 31, 2012. Wikimedia Commons has media related to New Democratic Party.